DX32R is your versatile digital audio Swiss knife - an interface and matrix designed for multiple audio applications such as multi-room recording studios, post-production facilities and audio distribution installations. It allows you to route all digital input and output and manage them on a mono channel basis within a single unit or a combination of units. With near zero latency, the DX32R can be used to expand I/O channel count and interface digital components, providing a high quality bridge between AES/EBU, MADI, Pro Tools HDX and the Dante IP audio network. DX32R include a 384x384 multiplexer, enabling all digital inputs and outputs to be routed in any combination; this enables the unit to also split signals for advanced signal distribution. 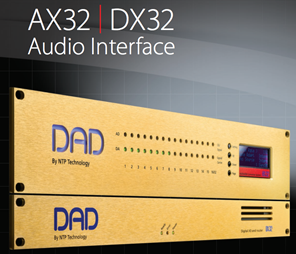 The DX32R IP Audio protocol is based on the robust tried-and-tested Dante™ digital audio network technology, and will interoperate with products of other brands that comply with Dante. The protocol is compliant with the AES67 standard for AoIP. The Dante and NTP IP Audio formats provide fast, flexible, and economical audio routing via IP and are compatible with the AX32 AD/DA converter, and other Dante devices. The IP Audio routing provides low latency, tightly synchronized, transport of uncompressed audio over Gigabit IP Ethernet Layer 3 networks using off the shelf switches, and routers for audio routing via one or more sub-nets. A total of 512 channels can be routed on a 1 Gigabit network, and more if the network capacity is higher. DX32R is TCP/IP controlled via one of the two Ethernet ports vi the DADman Control software available for both Windows and OSX. The routing of the IP audio via Dante is done by using the Audinate Dante controller software.